Eric Paschall driving the lane. @VillanovaMBB. 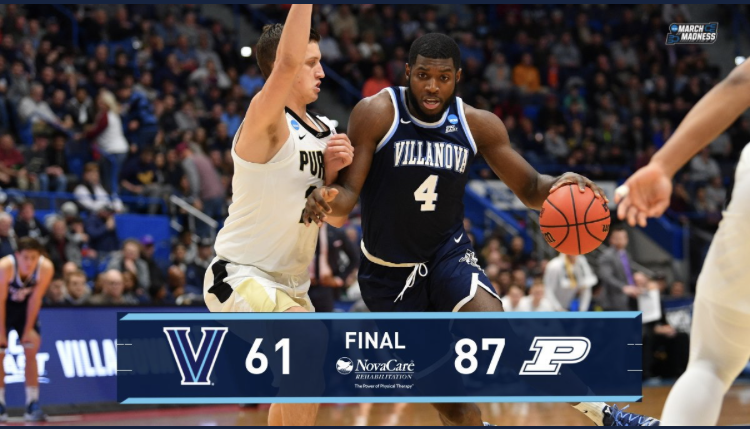 The defending National Champion Villanova Wildcats lost to Purdue, 87-61, in the second round of the NCAA Tournament on Saturday in Hartford, Connecticut. Purdue, who dominated this one early and held a 43-24 lead at halftime, was led by Carsen Edwards, who had 42 points on 12-21 from the field, including 9-16 from behind the arc, with 6 rebounds and an assist. Matt Haarms had 18 points (8-12 FG), 9 rebounds, and 2 assists. 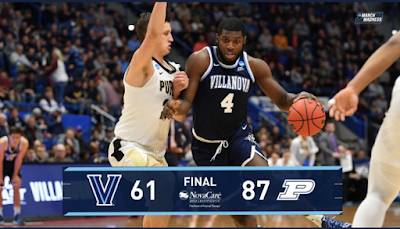 Villanova was led by their two seniors, as Eric Paschall had 19 points on 7-18 from the field (2-9 three-pointers), with 3 rebounds and 2 assists; and Phil Booth had 15 points (5-13 FG, 2-6 threes), with 4 rebounds and 2 assists. The Wildcats, who won two of the prior three national titles, had the best record in the Big East during the regular season and won the conference tournament. They finished the season with an overall record of 26-10. JAY WRIGHT: I want to congratulate Purdue on just an outstanding basketball game. They are a very, very good team. We knew that coming into the game. They just have great balance, inside game, iso game, drive, shoot threes, defend great as a team. Just really, really impressive, and we wish them luck going forward. They're a good team. Classy guys, too. We just, as a staff, did not get our guys -- we tried to make them understand their ability to hit threes and execute their offense with great precision, and we just didn't have them ready from the start. We just gave up, to a team like that, a lot of threes early, uncontested these. And then once you get a great shooting team like that going, and then you're overaggressive trying to take away those threes, then they start slipping. They get you on the inside, they get you on offensive rebounds. It became an ugly game. I thought it began with their ability to get threes and our inability to recognize where their shooters were. Q. I guess Eric and Phil, the only two returning seniors, there were no returning juniors. Realistically this wasn't the national contending team. Somebody didn't even think you would win a game in the tournament. Could you talk about the difference bringing along young players in the future, the job you two with all these freshman and sophomores and maybe making another run in a year or two from now? PHIL BOOTH: They did a good job all year. They bought in tremendously. We won't be here without them because of all the things they did, listening and learning. Demanding sophomores be like juniors and seniors on the team; making freshman not to be freshman. We asked a lot of them and they responded. I think this team will be in years to come very good. Next year they'll have a lot of talent and a lot of experience and they'll learn from games like this. ERIC PASCHALL: I mean, same as Phil. I mean, I feel like our young guys did a great job this year of just coming along. I mean, they've been through a lot this year. I feel like through this whole year, ups and downs, they'll take that on to the next year and years to come and do a great job of it. I mean, just feel like me and Phil just tried to show them what Villanova basketball is all about. I mean, it's about playing hard, and playing for your teammates and coaches. And I feel like in the years to come, they'll be very good. Q. So, what do you guys think that -- you know, there was a lot of emotion at the end of the game and especially with the seniors. Can you describe what you were feeling at the end of the game and what is your advice for, you know, your advice leaving the program, for the next age of students. ERIC PASCHALL: I mean, my emotion, I was just sad to not play in the Villanova jersey anymore. I thank Coach Wright for everything he's done for me. Without him, I wouldn't be here. I guess losing in your senior year, but at the end of the day, I love Villanova. I mean, everything they've done for me, every little thing, that's all the emotions that were happening. PHIL BOOTH: Yeah, just a lot of the emotion in your head, going through your head. Last college game, our last time with that special group of players we had. This young group, they did so much and learned so much. It's just a lot. It doesn't really sink in yet while you're on the court, because you're still just losing. But later on how much the University has meant to me, coaching staff, Coach Wright, players I played with. Couldn't have asked for a better experience. Q. Continuing with that point, the legacy that you guys have left at Villanova, if you could reflect on that and how this is just a loss, but the legacy you leave behind is probably bigger. Do you both feel that way? PHIL BOOTH: I don't feel that way right now, I'll tell you that. You know, going out like that, just wish it could have been better. But that's just more credit to the guys I played with, just been fortunate to play with a group of guys. Like this team here, just unselfish, all about the team, do anything for the team, for the win, or whatever it takes just to play Villanova basketball. Guys have bought in and this team is no different than any other team I played on in the past in terms of committed, wanting to play Villanova basketball. Wanting to be together, love one another. This group is special in those terms. It hurts going out like this, but there's a lot here. I learned a lot from this year. ERIC PASCHALL: Definitely not thinking about any type of legacy right now. I mean, it's just hard going out like this, but everything comes to an end. Again, I just feel fortunate enough to play with great guys throughout my whole career and them teaching me things to help me this year. I hope I did a great job of teaching our young guys how to continue this tradition of playing Villanova basketball. Q. Phil, I saw towards the end you were kind of talking to Jermaine. He was a little emotional. What kind of advice were you giving him, you know, him and Collin, and Dhamir? PHIL BOOTH: Just telling them how proud of them I was from this year and how much I've learned from them, and how much they bought in to Villanova basketball and would do anything for anybody on the team. I just told them to keep your head up. You'll be back here again. You'll learn so much from this. Try to keep their spirits up. Those guys have done so much for me, for this team. Became brothers, you know, connected with a group, maybe younger, two, three years younger. But we became very close with those guys. Just told them how proud I am and how thankful I am for them. Q. Now that the tournament is over, and when you get back to campus, Coach Wright, what are you looking forward to working on in practice and going forward from here? JAY WRIGHT: We have a really young crew next year. No seniors and these sophomores become juniors. We got a couple of these freshman we got to develop. So we've got a lot of work to do, but I'm looking forward to it. I like these young guys a lot, and tonight will teach them how hard you have to work to prepare every game and to play against the top teams. I hope Purdue's a Final Four team. I think they're good enough to be. But we have a lot of work to do. But I look forward to it. Q. You said you thought you were in a little bit of a race against time, you know, maybe try to buy another week of working with these guys, maybe get to that next level. Tonight didn't look like you were that close. Are you rethinking that or do you think maybe with a few more days and the right match-up, it could have swung a little differently? JAY WRIGHT: Yeah. In these games, match-ups and the way things go, the score's not always indicative of where you are as a team. We don't have the man power -- we got to keep the tempo down. We've done it all year. We don't have the man power to play from behind and then speed up the game. Once we decided to speed up the game, it was desperation. We knew we were going to be in trouble. We needed to keep that close and grind it out. That's what we needed to do. When they started drilling those three and got up 19 at halftime, it was not a good situation for us. So, I don't think we were that far, but I think we ran into a really good team and a really tough match-up for us. Q. Jay, I wonder if it almost felt like a Freaky Friday situation for you. Because this game -- the Kansas game you won in the Final Four last season went the exact opposite way. I mean, you guys came out so hot. Felt like Purdue did the same thing, too. I wonder if that came into your mind and as a veteran coach, when a team like that comes out and does this. It's a devastating end for Eric and Phil, but sometimes it's is just not your night? JAY WRIGHT: I would be lying if I said that didn't come into my head during the game. You job as a coach, is get it right out of your head. But it did come in there, and you just have to compete. You have to continue to compete each possession. And this game is a humbling game. You could be on either side of it. And it's one of the things we said to the guys after the Kansas game: Give those guys respect because we came out and made every shot. It doesn't happen every night. And they did it tonight and when it happens to you, you give them their credit, and you learn from it. But if you get in them early and don't let great shooters get hot, and you keep the game tight, that's what you have to learn from that. That's what we didn't do. We didn't get up on Edwards early, didn't get up on Cline early, and when great shooters get hot, you're in trouble. That's what happened tonight. Q. Jay what was your message to your seniors especially the last few guys that have been there for you during that first National Championship run in 2016. JAY WRIGHT: Thank you. And from me personally as the head coach first, thank you for keeping the culture strong and the tradition alive this season rather than going for your own personal glory. And then on behalf of the whole Villanova community, thank you. On the court, off the court, they were gentlemen, leaders. They were the consummate Villanova basketball players. Q. Jay, kind of piggybacking off of Matt's question, does this Purdue team and program kind of remind you of Villanova in the way that you guys have built your program, the way the offense can click, especially along the perimeter with someone like Carsen Edwards or Ryan Cline at all? JAY WRIGHT: Yeah, it does. It reminds me of our team last year. Just great perimeter skill, but still have a drive game and a good post-up game. Really unselfish. And you could see they had a confidence shooting the ball, no fear of failure, very impressive. I did think of that. Q. Jay, obviously two of the last three years, your team was cutting down the nets. Worst NCAA Tournament loss in program history for you all tonight. How do you process that? And what do you tell the guys going forward about the highs and lows of this game? JAY WRIGHT: Yeah. The game's humbling, you know. And it's good for us sometimes. You don't choose to be in this position. But when you win, you've got to realize that there's guys on the other side that are working just as hard as you, and you've got to be respectful of them and understand you could be on the other side of it, and today we are. And it doesn't mean we can't get back there, but we have to be respectful and give Purdue credit, and we have to get back to work. Stay hungry and keep getting better. Q. Coach, this was a rebuilding year really for the whole Big East not just Villanova. It's been so strong for several years. Looks very strong again. Is there any chance just not having quite the same level of competition throughout the year made you not as prepared for going up against a team like this today? JAY WRIGHT: I don't know. That could be. Our league was a really young league this year. A lot of young teams who will have everybody back next year. There will be a lot of really good teams. We could be one of the younger teams next year. But I think we were prepared for this game, I think in terms of competition, you know. I think St. Mary's is a really good team. We played Florida State during the year. I just think you saw a lot of young Big East teams this year just get worn down at the end, and when you get to this tournament, you run into experienced teams and that's what happens. Q. Jay, Jermaine Samuels may be one of the lone bright spots in this game, seemed to be really effective in the first half and also grew through the second half of the year. I saw you coaching him throughout the game quite a bit one on one. I wanted to get your thoughts about Jermaine and how he grew and what he means to the program. JAY WRIGHT: Yeah. He comes so far. Last year he really struggled picking things up. Then he broke his hand. It was a really tough year for him where he didn't really get the experience we needed him to get, so he had to go through it all this year. And he did it under fire and has done an amazing job. Has really become a really good player for us. He's going to be a big part of our team and a leader. We have no seniors next year, so he's going to be a leader on this team. He's very important to us, he's a great kid, and he will take the responsibility of being a leader very seriously. I think he's got a great upside.